Federal Way is in the midst of rapid demographic, economic, and political change. While the city has become one of the ten largest and most diverse in Washington, affording the city's median rent requires a full-time job at $19.67 per hour — far more than is typically paid by the chain retail, food service, call center, and other low-wage jobs which dominate the local economy. Federal Way is in the midst of rapid demographic, economic, and political change. At the same time as the city has grown by more 30% over the past two decades to become one of the ten largest cities in Washington State, the non-hispanic White population has actually declined. Federal Way has substantially lower housing costs than much of the rest of Central Puget Sound, but affording the city's median rent still requires a full-time job at $19.67 per hour — far more than is typically paid by the chain retail, food service, call center, and other low-wage jobs which dominate the local economy. 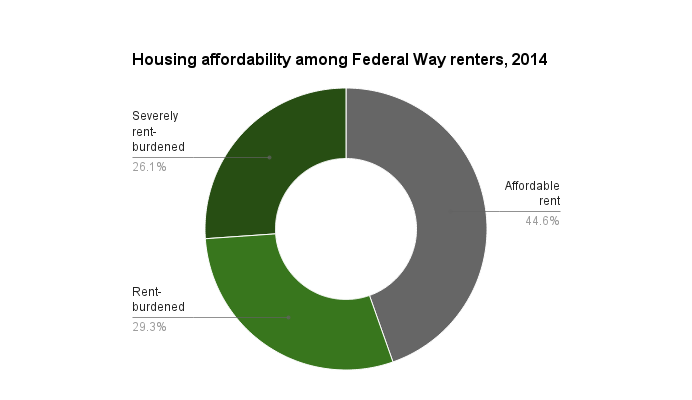 As a result, more than 1 in 4 Federal Way renters are severely cost-burdened, paying more than half their incomes toward rent. While the priorities of 30th Legislative District representatives do not yet fully reflect the shifting local landscape, it is clear that wages, housing and other economic justice issues are of growing importance to this community. Local candidates for elective office should be careful to avoid being on the wrong side of supermajority support for good jobs in a place that so badly needs them — particularly somewhere which is swinging and shifting as quickly as Federal Way. Only incorporated in 1990, Federal Way has grown more than 30% in the past two decades, and now ranks among the ten largest cities in Washington State. Remarkably, the non-hispanic white population has actually fallen by 7,000 as the people of color population has grown by almost 38,000. Federal Way's population growth over the past decades has come entirely in communities of color. 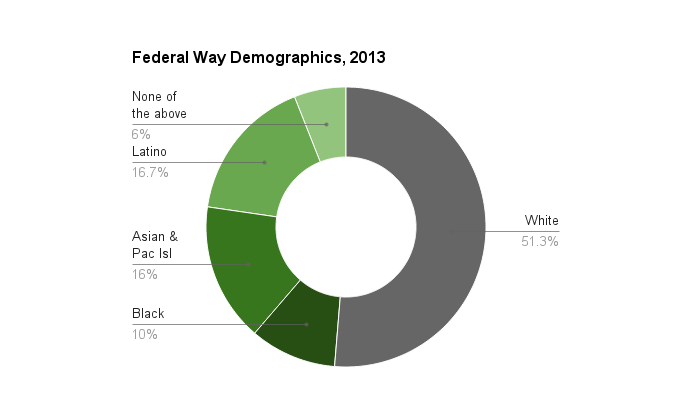 Federal Way is likely to soon become one of the few Washington cities with a majority of people of color. “Right now I’m in Federal Way. It’s a nice neighborhood — fairly priced. I go to Highline Community College, where I’m currently studying accounting. School, work, school, work — that’s really my life right now. The way I see it is, why shouldn’t we get $15? What do the companies fighting against it have to argue against how hard we’re working out there — what are they doing to say we don’t deserve it? I need to be treated fairly, and I need what I’m worth. And $15 should be just the basic minimum." While Federal Way's median rent of $1023 in 2014 is relatively affordable compared to Seattle & Bellevue, an income of $40,920 is necessary to afford this rent by standard measures — in other words, a full-time job paying $19.67/hour. The lack of jobs paying that kind of wage means that housing remains incredibly expensive compared to incomes, and many households are strapped. One in four Federal Way renters pays more than half their income in rent. By the standard measure of housing affordability — no more than 30% of income to rent — less than half of Federal Way renters have housing they can afford. More than 1 in 4 are severely rent burdened, which means they pay more than half their income towards rent. 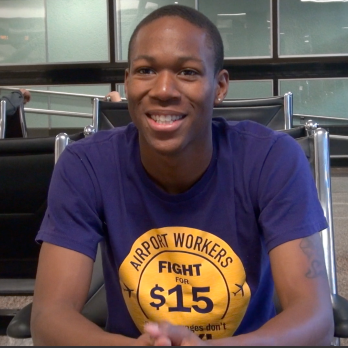 “I'm a cashier at McDonald's and I used to live in a 2-bedroom apartment, in Skyway, basically in Seattle. There were a lot of us in one apartment, because Seattle is extremely expensive. You think about everybody chipping in to pay rent and bills and stuff, and it’s still not enough. Now I live in Federal Way, and there’s less people and more room. I like my job, but a lot people aren’t happy right now. Getting $15 would make a lot of workers more happy about coming into work, and make your place of business a better place. It would make everyone’s life a better life. With the looming departure of Weyerhaeuser’s corporate headquarters to Seattle, Federal Way is left with a huge gap — no real major employer anchors the local economy. In fact, job quality is such a struggle that more than 10,000 people leave the city each day for work, a 10% reduction in the the city’s daytime population. This may actually be of economic benefit at the moment, as seven of the 10 most common occupations in the city typically pay poverty wages. The Commons Mall is also a major employment center, primarily low-wage retail jobs for national chain stores like Sears, Target, and Applebee's. 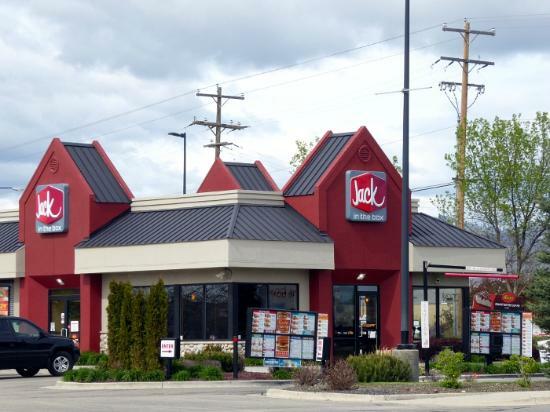 A Federal Way Jack in the Box worker reports that when she told her manager she suspected a customer was trying to pass a counterfeit hundred-dollar bill, she was instructed to ignore it and process the order. The bill was later rejected by the bank, and the manager took $80 from the worker’s check on the next payday to make up for the shortfall. Workers on closing shifts at the local Party City say they are instructed to clock out at a specific time, and then continue working for as long as it takes to clean up the store. This practice seems to be incentivized at the corporate level — store managers are awarded bonuses for keeping labor costs down, and also for receiving positive cleanliness reports from secret shoppers. And sometimes wage theft occurs before the job even starts. A Burger King interviewee was told he'd likely have to work late shifts, and because labor needed to be kept low, he would be asked to clock out and unload the truck. Federal Way is in the midst of a historic population boom, but incomes are depressed, and the community has yet to form a strong economic base or collective identity. Housing, while more affordable than in Seattle, still burdens many residents. Retail, food service, call center, and healthcare make up the bulk of the city’s jobs, and while the national chains that dominate these industries book billions in profits, workers are frequently paid poverty wages. The resulting low levels of disposable income hold back local economic development. Senator Mark Miloscia was the sole Republican co-sponsor of both the paid sick days proposal and the statewide minimum wage increase debated last year. Representative Linda Kochmar voted against minimum wage and paid sick days in the House. However, she was the lone Republican to support tenant protections this year. Representative Carol Gregory, on the ballot in this year’s special election, cast critical votes in support of minimum wage and paid sick days bills. While the issue positions of the 30th legislative district delegation do not yet fully reflect the shifting landscape of Federal Way and South King County, it is clear that economic justice issues are of growing importance. It is also apparent that the local economy would benefit from more good jobs that pay living wages, and support for higher pay and workers rights is strong in Federal Way and throughout South King County. Any race in which the candidates don’t agree on raising wages could threaten to polarize on that very point. No candidate should want to be on the wrong side of supermajority support for good jobs in a place that so badly needs them — particularly in a place which is changing as quickly as Federal Way.